When setting up your holiday decoration display that includes blow molds, you’ll want to take extra care to secure large figures so they’re protected from damage caused by wind. Setting up your outdoor holiday decoration displays for Christmas or Easter is a fun and exciting time in anticipation for the holidays to come but you will want to spend time properly fastening and securing your decorations, so they stay in place all season and don’t get damaged along the way. This is especially true for blow mold figures. Blow molds in general are durable and can take a beating but you don’t want to let them see a beating if you can help it. While blow molds are usually very durable and strong, if tossed around such as by the wind, they can get dented and the paint scratched very easily. To avoid this it’s important to secure blow molds of all sizes, especially larger ones. Taller and wider blow mold figures catch more wind simply because they have a greater cross sectional area to catch the blowing wind and their center of mass is higher off the ground, making them tip over more easily. Larger blow molds are also more expensive than smaller ones (in general) and it’s a good idea not to let your hard earned money go blowing around in the wind hitting the ground, trees, rocks or anything else close by. There are a couple of good ways to go about securing large (or small) holiday blow molds. Sometimes, you may have to try one or more of them out or a combination thereof to get the best success. A very simple method of securing large blow molds is the use of plastic bags filled with gravel (small rocks). You will want to use two or three plastics bags (double or triple bagged) filled with the gravel. Be sure to tie the bags tight, don’t let the rocks escape. Don’t fill the bags too full as they will need to easily fit through the access hole at the base of the figure. Using two or three bags of gravel in the base of the figure should secure the figures pretty well. Be careful and gentle when placing the bags into the base and support the base with you hand to avoid bending the plastic of the base due to the weight of the gravel as you are setting the figure back onto the ground. While you are doing all this spread the bags evenly around the base so the figure can resist wind blowing from all directions. Also, try not to let the bags of rocks obstruct the lighting of the figure at night time causing a shadow. You will get the hang of it as you do it. If gravel is not available, you could also use sand instead in the same manner shown above, but be sure to tie the bags tight and use several of them or else it will probably spill. You can also elect to use twine (approximately a quarter inch in thickness) to secure the blow mold figures. If the figure is displayed in front of a fence post, front porch column, a wooden swing post, or any other type of smooth column surface, the blow mold can be secured directly to it by wrapping the twine (around the figure towards the center of its height) and tying it snug and fairly tight (but not too tight as to cause damage) as to allow little to no movement. If a wooden post is not present to tie to, you can simply drive a tall wooden stake (something like a 1” x 2” piece of lumber that’s 3 to 4 feet tall) into the ground where you want to place the figure and use the twine to tie it securely as you would to a fence post. You could also use small light stakes (roughly 6 inches in length, usually sold in stores around Christmas time), to stake into the ground to tie the twine to. You can do this by placing a stake into the ground on the front left side of the figure, tying the twine to it and running the twine one full loop around the figure (near the center of its height) and bringing it back to the front right side of the figure and tying it to another stake. If you do the same thing in the opposite direction and set a stake on the left back side of the figure, run the twine around the figure one full loop (about at the height you did before) bringing it to the right back side and pulling out the slack (not too tight though) just before you place the last stake, you’ll have a well secured blow mold. You will see this is a quick, easy, and effective way of securing blow mold figures. The location where you select to display can also be a way of securing the blow molds. Blow molds placed out in the wide open away from any obstruction will get the full brunt of wind but if you place figures near other objects such as walls and trees, the wind effect can be less intense. For example, this author displays a large Christmas blow mold nativity scene with a wooden stable that includes the holy family, the shepard, and the three kings, along with some animals. Well, the three kings and shepard are taller figures sitting outside of the stable and get a lot of wind and need a lot of securing. Mary and Joseph (along with Baby Jesus) on the other hand, sit inside the stable (which is open at the front), need almost no securing, but have a couple of bags of gravel in their bases just to be on the safe side. This wind shielding effect can definitely protect the figures from wind, just be sure it’s actually there before you decide not to actively secure the figures. Try out these techniques for securing your large holiday blow molds in your Easter and Christmas displays and protect your figures from wind damage. This article has been published on http://wizzley.com/, and its author, CEdward, does not permit it to be republished elsewhere. Links are appreciated, but please no copying. Christmas holiday blow molds make a great lighted decoration to place in your outdoor lighted Christmas display and this article will show you some options you have to select from. As the Christmas holiday approaches and you are beginning to plan your lighted outdoor display, you have many great Christmas decoration types to choose from. 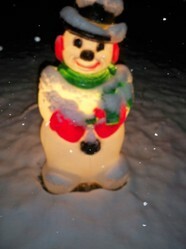 Blow molds make great outdoor decorations for holidays like Easter and Christmas. Blow molds are however, adversely affected by sunlight exposure and should be protected from it.